Alongside the Butterworth exhibition at the International Anthony Burgess Foundation in August–September of this year, The Exhibition Centre for the Use and Abuse of Books presented an evening of talks accompanying Gareth Jackson's Lord Horror — The Dark and Silver Age, an experimental film based on the Lord Horror oeuvre. This included presentations from broadcaster and art critic Bob Dickinson, art historian and journalist Michael Paraskos, and academic Jonathan Barlow, discussing Lord Horror and the culture surrounding Savoy. 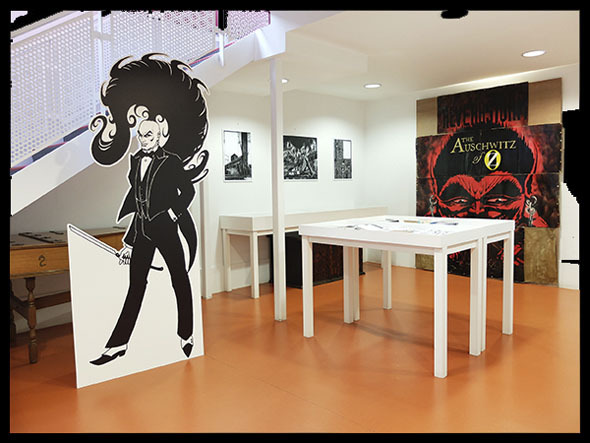 To concide with this, The Exhibition Centre for the Use and Abuse of Books also commissioned a series of short films from seven artists and artist collectives who were asked to respond to the pre-Savoy small-press magazine, Corridor, published in the 1970s. Clara Casian's Burroughsian film short, A Savoyard's First Brush with Censorship, which uses Corridor #2 as its jumping-off point, is a film that looks at the context behind censorship in 1970 Manchester through personal stories, records and archive footage. Casian is currently working on a feature-length expansion for wider release. The Butterworth exhibition was the culmination of an eventful two years for Savoy. Rising academic interest in the company started with the long-awaited publication of our graphic series Reverbstorm in book form in January 2013, and continued in November 2013 with publication of David Brittain's Eduardo Paolozzi at New Worlds, a study of the artist's connections with the British wing of the so-called New Wave of science fiction in the late 60s and early 70s. Both books featured strongly in the The Science Fiction 'New Wave' At Fifty conference at the University of East Anglia in May of this year. The Butterworth exhibition will next be seen at Kent State University, Ohio, from January to May 2015. On their recent tour of the UK, The Magic Band—John "Drumbo" French, Denny "Feelers Reebo" Walley, Mark "Rockette Morton" Boston, Eric Klerks and Andy Niven—played Band on the Wall, Manchester, with Savoyards in attendance. Under the redoubtable French a spellbinding show took place which can be viewed in full and in high-definition here. 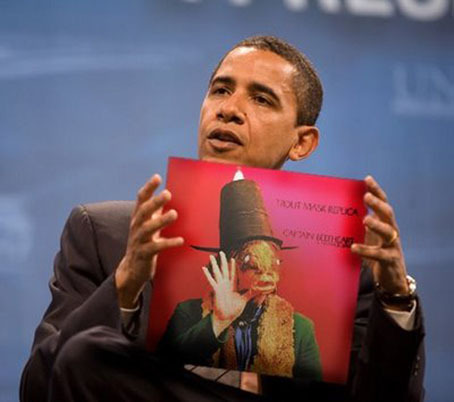 The best band in the world playing the best music in the world, courtesy of Captain Beefheart RIP. Since Roger Eagle was mentioned here recently it's worth noting that a radio show of rare reggae and dub tracks from Roger's own collection can now be heard at Mixcloud. Roger was a regular contributor to Steve Barker's On The Wire show on BBC Radio Lancashire, one of the longest-running music shows in the UK, and the show is part of a growing On The Wire archive. 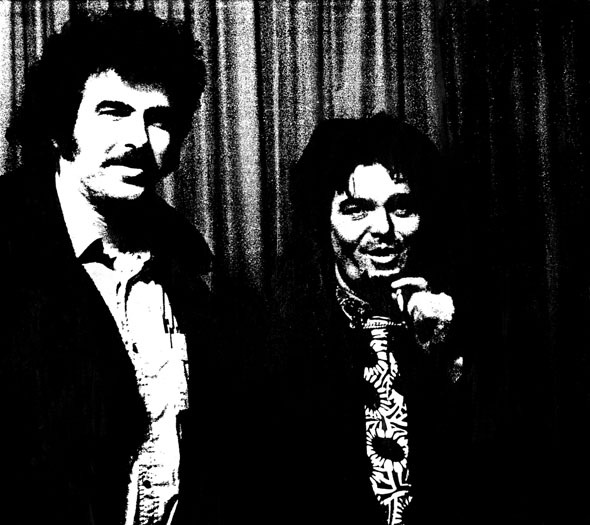 In our obituary notice for the great Roger Eagle (see news for July 2012) we mentioned a rare photo of the man with the equally great Captain Beefheart, taken (at a guess) during one of the Magic Band's excursions into the north of England. The temporary inaccessibility of the photo had caused it to assume fabled status in the Savoy office but here it is at last. Not the best quality since it's been photocopied a couple of times but you're unlikely to see this anywhere else. Had it turned up sooner it would have gone into a recent Savoy pot-pourri. It missed its chance in print so now it's a web exclusive. 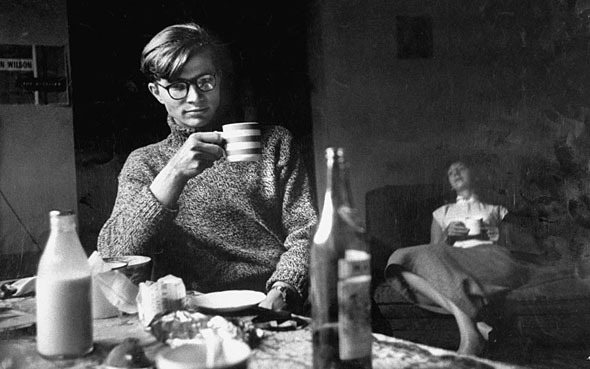 Colin Wilson, who died on the 5th December last year, was definitely "something to be". Wilson's inspirational debut, The Outsider, described in its 1978 edition as "the classic study of alienation, creativity and the mind of modern man", has been in print since its first publication in 1956, and will continue to be reprinted for decades to come. Savoy was privileged to publish a new edition of his uncompromising crime novel, The Killer, with a fresh introduction and additional material; the Savoy edition of David Lindsay's A Voyage to Arcturus featured Wilson's Lindsay essay, 'The Haunted Man', and a new afterword, while another essay, 'The Truth About Wilson' (about wartime comics hero Wilson the Wonder Athlete), appeared in Sieg Heil Iconographers. Wilson provided a splendid review of Robert Meadley's A Tea Dance at Savoy for Headpress magazine, and his philosophy of optimism, honed on the battlefront of a lifelong fight against pessimistic world-views, is crystalised in Colin Wilson: Philosopher of Optimism by Brad Spurgeon, published by a Savoy offshoot. We regarded Colin Wilson as a brother-in-arms. His sensibilities were always in accord with ours. His unambiguous opinion of A Voyage to Arcturus was brave, bold and definitive: "One of the greatest books of the century. The most extraordinary feat of imagination in English fiction." After the UK press underwent one of its periodic put-downs of Wilson, Robert Meadley wrote a book-length riposte to his detractors, The Odyssey of a Dogged Optimist, which is available on this site as a free download. The philosophy and fiction of Colin Wilson will continue to be relevant and necessary when the likes of Adam Mars-Jones, Lynn Barber, Humphrey Carpenter and the wretched Clive James are vanishing into a deserved oblivion. Savoy regard Wilson as a significant writer and autodidact, among the very best of a generation of British literary mavericks that would include JG Ballard, Michael Moorcock, Alan Moore, Derek Raymond, Iain Sinclair and Alan Garner; a company of ferociously talented iconoclasts and anti-establishment figures. Wilson always walked his own path undeterred by the carping of the literary establishment; his thinking broke with hidebound tradition, setting him alongside the outsiders in fiction, philosophy and criminality whose example he spent his life exploring. His favourite hero from the Wizard comic, Wilson the Wonder, is a fitting analogue for one of the 20th century's greatest thinkers: always ahead of his detractors, and clearing obstacles at a single bound. Presenting Savoy's long-overdue tribute to the most important magazine of the 1960s. Forget Oz magazine and International Times, New Worlds was a pinnacle of the 1960s' counterculture, standing in the same relation to underground publishing as The Beatles did to pop music. Without the example of New Worlds there would never have been a Savoy Books. From 1964 to 1971, under the far-sighted editorship of Michael Moorcock, New Worlds grew from a small science-fiction monthly to what JG Ballard later called 'one of the most exciting magazines of any kind in this country'. Its writers discarded speculations about future technology and life on other planets, turning their attention to the increasingly technologised media landscape of the 20th century. 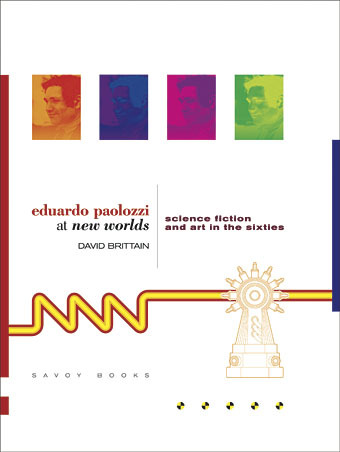 In Eduardo Paolozzi at New Worlds: Science Fiction and Art in the Sixties, David Brittain examines the magazine during its prime period, throwing light on the interactions of the art of the time with what Judith Merril and Harlan Ellison called 'the new wave of science fiction'. The work of artist Eduardo Paolozzi was showcased in the magazine along with that of Pop Art colleague Richard Hamilton. Paolozzi's close association with New Worlds was acknowledged via a masthead credit as 'Aeronautics Adviser'. Brittain's book places Paolozzi's 'science fiction' art of the late '60s in the context of the new SF, and offers fresh insights into the way images and a fragmentary, collaged approach to writing informed the controversial prose of Ballard, Moorcock, Brian Aldiss, Norman Spinrad, M John Harrison and others. The book contains rare and unseen images from the archives of New Worlds and the Eduardo Paolozzi Foundation, including excerpts from what is thought to be an unpublished science-fiction novel by the artist. There are also new interviews about the magazine and its times with editor Moorcock, art editor Christopher Finch, designer Charles Platt, contributor Michael Butterworth, and critic John Clute. 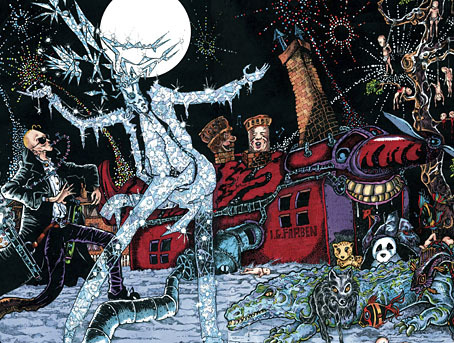 With an introduction by Rick Poynor, and endpaper illustrations by Pamela Zoline. Design by John Coulthart. Eduardo Paolozzi at New Worlds is available from Savoy, Amazon and specialist art outlets. The new hand-grenade of a book from David Britton! Letting his romancer's torch shine on Holocaustic goings-on in modern-day Manchester, the Mac Daddy Horror sashays forth as a giant glass rapscallion, puffing out his killing philosophy. In their customary role as the Devil's idle hands, Meng and Ecker spread a freaky-deaky comedic 'Umgawa!!!' over Porchfield Gardens. The Razor Kings' Magic Garden unveils its bounteous nourishing beauty to refugees turned blue from Planet Auschwitz. Oooh'weee. All things are well—not. 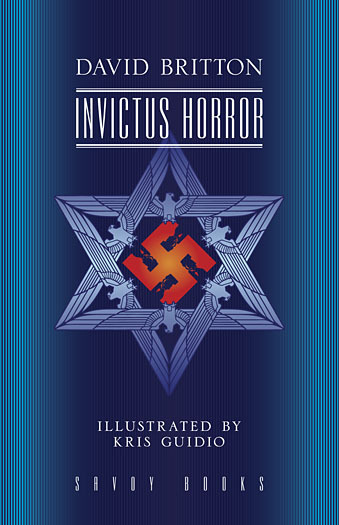 Invictus Horror is a one-hundred-and-thirty-page hardback copiously illustrated in black-and-white and colour by Kris Guidio bowing-in at the top of his game. Available from Savoy or from all good bookshops and Amazon.